"This is the war on terrorism. Whether you characterize it as the front line or not is for someone else to decide, okay? We are definitely in the thick of things in this country and it's gotta succeed." 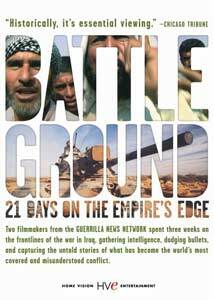 Watching BattleGround: 21 Days at the Empire's Edge is likely to evoke an odd feeling in audience members. Filmed in October 2003 by the Guerilla News Network's Stephen Marshall and Anthony Lappé, the issues shown and discussed are simultaneously current and dated. Iraqi citizens are seen predicting the US-led invasion will result in a constitutional democracy, which recently did occur, but surrounding these scenes are violence, civil unrest, and utter confusion. It's a historical documentation of the war, yet as events continue over there, in a year's time perhaps this movie could be irrelevant from a geopolitical perspective. Marshall's chooses to not focus on the larger events in Iraq, placing focus on the human face of the war instead. The result is a unique, balanced look at the Bush Administration's foreign policy that never really feeds an audience's desire for good ol' political rhetoric. Consisting of interviews with Iraqis, US soldiers, and a journalist, the movie provides a somewhat incoherent look at Iraq's current state. BattleGround shows that, like in any war, there are people who both suffer and rejoice in the turning of events. Certainly one good thing to come out of the Iraq War is the story of Farhan "Frank" al-Bayati, who participated in the Shi'ite uprising in 1991, now able to return home and see his family in post-Saddam Iraq. On the flip side, the destruction of a date farm by the US Army in pursuit of insurgents carries the weight of crippling a family's income, not to mention destroying a food source. Such stories, and many more, are collected by Marshall's keen camera. There are many facets to the film and which one will appeal to you is largely dependent on your own opinions and interests. For the intellectual conversationalist, the debate between Iraqi translator Rana al Aiouby and Egyptian businessman Heshan Barbary provides much food for thought, as the two articulate strong arguments against and for the US invasion. For the pro-active reformer, Raed Jarrar's efforts in the reconstruction of Iraq may be the documentary's highlight. One of the more engaging bits of information in Marshall's documentary surrounds the use of Depleted Uranium ammunition. American forces use it to gain a strategic edge by piercing enemy armor, but Marshall and Jarrar claim it puts both American and Iraqi lives at stake years after the battle is won or lost. Personally, the scenes showing Farhan reunite with his loved ones and journeying through his homeland come across as the most emotionally powerful. An especially affecting moment comes when he asks a group of men whether they want American freedom or an absolute Islamic state. Everybody gathered before him prefers to live under their religious code, which seems to create an inevitable conflict for the US forces. Following Col. Fred Rudesheim and Lt. Col. Nate Sassaman, Marshall presents a striking picture of the dangers, frustrations, and successes of the military. A city council voices displeasure at Sassaman's tactics, but his "take it to the enemy" mentality does yield a decrease in violence. Even more impressive than these men is a candid interview with Sgt. Robert Hollis, who speaks with tremendous dignity and insight. Much of what he discusses, concerning US motives for the war beyond the Saddam regime and the Iraqi insurgency's conduct, rings true and probably never crosses the minds of most news pundits. The flaw with BattleGround is in its camerawork and editing. When Rana and Heshan are debating, there's a rather awkward use of split-screen to show two angles of Rana's face. The result causes a disconnect, reminding the viewer that this is a documentary that is manipulated through editing decisions. Another filmmaking technique that becomes tedious is the constant and prolonged use of montages. Marshall is a tremendously talented filmmaker, but this isn't an MTV music video. Next to Gunner Palace and The Dreams of Sparrows, Marshall's documentary suffers, ironically enough, because it is cinematically superior. Those two documentaries are rough, unpolished works that place the viewer right into the thick of things. BattleGround reminds us that it's a documentary, causing a disconnect between the screen's content and the viewer's reaction to them. While the filmmaking may lessen the documentary's overall impact, the interviews and scenes captured are so striking and fresh that the most disinterested citizen cannot walk away without being stirred. Opting to tell the human stories of the war, BattleGround goes beyond a mere pro- or anti-war stance. It confronts us with the reality of Bush's policy, whether we like it or not. Image Transfer Review: The original 1.78:1 aspect ratio is preserved in this nonanamorphic transfer. The picture is fairly crisp and the detail is as strong as one could hope, considering that the movie was shot on video. The image quality is largely dependent on the source footage, but the transfer seems to be a fairly accurate record of the theatrical experience. However, the nonanamorphic transfer is disappointing and keeps the picture from looking as good as it could. Audio Transfer Review: The Dolby Stereo 2.0 sound mix comes across quite nicely, especially when played in Pro Logic. Sound separation and directionality are used effectively, never distracting from the image and opening up the mix to an aesthetically pleasing experience. Dialogue, which is in both Arabic and English, is surprisingly clean and audible at all times. The rear channels don't call much attention to themselves, but a trace of the film's score can be found in the surround speakers. Insert�contains liner notes by Film Comment senior editor Chris Chang. Exclusive Interview with Director Stephen Marshall and Producer Anthony Lapp��a video interview with the two filmmakers about the documentary's origins and their views on the news media. Breakfast at the Al Safeer�a continuation of the conversation between Rana al Aiouby and Heshan Barbary that is featured in the documentary. Extras Review: Prior to the disc's special feature content, there's an insert containing liner notes by Chris Chang. As the senior editor for Film Comment, Chang provides a timeline of certain events in the war, as well as a brief review of the documentary. It's a fairly short introduction to the documentary. On the DVD itself, an Exclusive Interview with Director Stephen Marshall and Producer Anthony Lappé (16m:36s) covers the project's origins and the general ideas behind the Guerilla News Network. The two men have some remarkable stories about the making of the documentary, especially since they didn't plan to make it until they were already flying to Iraq. However, the waning moments of the interview become too preachy, as they both start opining on journalism and the war. Up next are seven deleted scenes. They can be played individually or all together (31m:16s). The footage here is a mixed bag, with some of it actually included in the finished documentary. The final scene, Sgt. Hollis, ends with perhaps the most poignant and devastating question one could ask. Don't miss it. Following that is Breakfast at the Al Safeer (19m:12s), which is a longer version of the Rana al Aiouby and Heshan Barbary conversation shown in the movie. Overall, this feature is quite good and seeing these two disagree is at once disheartening and strangely comforting—at the very least, it shows Iraq now has free speech. Rounding out the supplemental material are the trailers for the documentary, In the Year of the Pig, and Deadline. Additionally, there are two subtitle options. One is an English track that subtitles the Arabic dialogue, while the other subtitles all dialogue in English. Both can be accessed via your remote. BattleGround: 21 Days on the Empire's Edge helps to put a human face on the Iraq War, with astute insights persevering over gimmicky filmmaking. The documentary's presentation is adequate, suffering from a nonanamorphic transfer, and the extras are good.